His Holiness Maharishi Mahesh Yogi is regarded as the world’s foremost sage and teacher of the ancient Vedic tradition of knowledge. The core of Maharishi’s teaching is his Vedic Science and Technology—the science and technology of consciousness—which unfolds the full potential of human consciousness and improves every area of life. The Global Mother Divine Organization was founded to bring this profound knowledge to the women of the world. In 1955 Maharishi Mahesh Yogi began teaching the simple, natural Transcendental Meditation® technique throughout India. His message: ‘The purpose of life is the expansion of happiness’ and ‘every human being can effortlessly unfold his or her infinite potential’. In the following decades, Maharishi traveled around the globe many times teaching Transcendental Meditation and its advanced techniques to people on every continent and establishing an extensive worldwide organization. Today the technique of Transcendental Meditation is the most widely practiced and extensively researched program for self-development in the world. Over six million people in all parts of the world have learned Transcendental Meditation. Over 20,000 teachers of the Transcendental Meditation program have been trained and more are continuing to be trained. More than 600 scientific research studies at over 250 independent universities and research institutes in 33 countries over the past 40 years have validated the profound benefits of Maharishi’s Transcendental Meditation program for the individual and for every area of society, including health, education, business, industry, rehabilitation, defense, agriculture, and government. In 1976 Maharishi introduced the TM-SidhiSM Program, including Yogic FlyingTM—advanced techniques that dramatically enhance the benefits of Transcendental Meditation. Extensive scientific research has shown that the group practice of Yogic Flying produces an influence of peace and harmony throughout society. 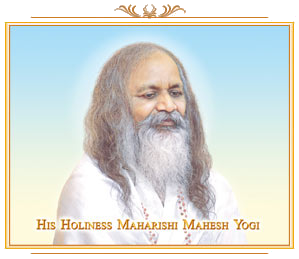 Maharishi created many groups of peace-creating Yogic Flyers around the world to radiate this highly purifying and harmonizing influence in world consciousness. Today more than 300,000 people around the world have learned the TM-SidhiSM Program and are practicing Yogic Flying daily. As well as bringing out the profound effectiveness of Vedic knowledge, the knowledge of consciousness, for spiritual development and world peace, Maharishi revived and restored to their full effectiveness the ancient Vedic sciences of health care, architecture, agriculture, education, defense, and administration. Maharishi established schools, colleges, universities, medical centers, and health clinics all around the world to make this knowledge available to everyone. In 2000 Maharishi founded the Global Country of World PeaceTM to offer enlightenment to every individual and invincibility to every nation. The Global Country of World Peace includes all nationalities, cultures, religions, and creeds. It unites the peace-loving people of the world in a global initiative to nourish and strengthen every nation by applying Maharish’s Vedic technologies for fulfillment of every area of life. The Global Mother Divine Organization was founded in 2007 as the ladies’ wing of the Global Country of World Peace to bring these Vedic technologies to the women of the world. During his 53 years of teaching around the world, Maharishi was the quiet guardian of all nations, continuously caring for the wellbeing of all mankind. Maharishi attributed all of his achievements to his spiritual teacher, Shri Guru Dev, His Divinity Brahmananda Saraswati, Jagad Guru Shankaracharya of Jyotir Math in the Himalayas—the most illustrious embodiment of Vedic wisdom in the eternal tradition of Vedic Masters.